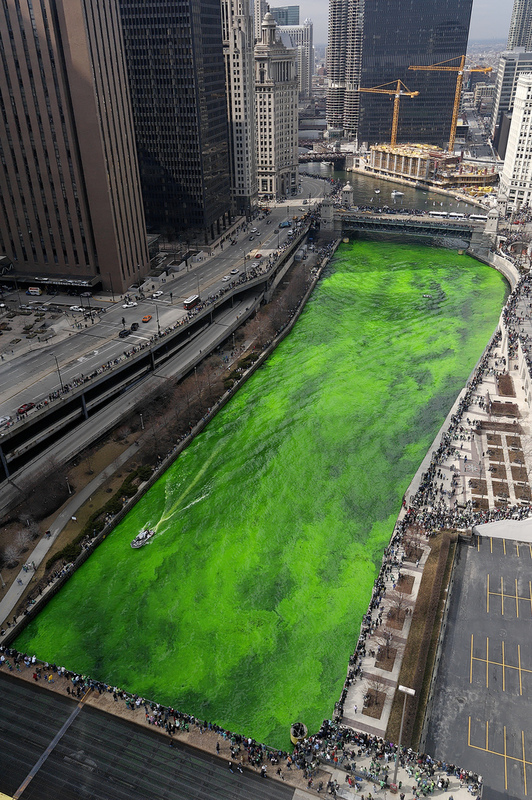 For many of us St. Patrick’s Day brings a day full of parades, green beer and shamrocks but in the city of Chicago St. Patrick’s Day also brings a unique tradition: dyeing the Chicago River green. This tradition has a particularly interesting history and is must see if you are in Chicago this St. Patrick’s Day. The tradition began as somewhat of an accident. In 1961 a plumber showed up at the Plumbers Hall wearing white overalls that were stained an Irish green. The cause of the stain was a dye used to detect leaks into the river. Steve Bailey, who was head of the local plumbers union at the time suggested that they dye the river green for St. Patrick’s Day. After discussing the idea with the port director and they decided to follow through with the idea and dye the Chicago River green through private funding. Workers dying the river green. The dye starts as an orange powder but turns green once its dissolved. In 1962 they dyed the river green for the first using a 100 pounds of dye. It may not sound like much for a river but it resulted in the river turning green for an entire week! After a couple of years of experimentation they were able to settle on the right amount to only turn the river green for one day. Today the event remains privately funded and the dye used to turn the Chicago River green is environmentally friendly. Unlike the original oil based dye, which was used until 1966, the current dye is vegetable based ensuring that the water quality of the river is unaffected. 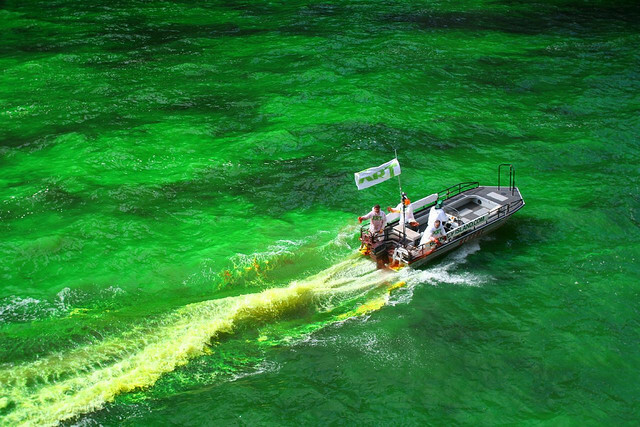 This year the river will be turned green starting at 10 am on St. Patrick’s Day (March 17th 2012). For the best views of the river, head down towards the Michigan Avenue Bridge. The area also has several attractions such as the London Guarantee Building, the Wrigley Building and the Heald Square Monument. We recommend you arrive early for the best seats and then enjoy the St. Patrick’s Day parade which begins at the corner of Columbus Drive and Balbo then continues North to Monroe. Be sure to download the mTrip Chicago Travel Guide to navigate your way through Chicago.